Paint Out is a script that allows you to control, manage and visualize a large number of Paint Strokes easily and intuitively. In many situations, a few clicks can eliminate tracking markers, dirt or other unwanted features from a scene that would otherwise take many hours of manual paint work. 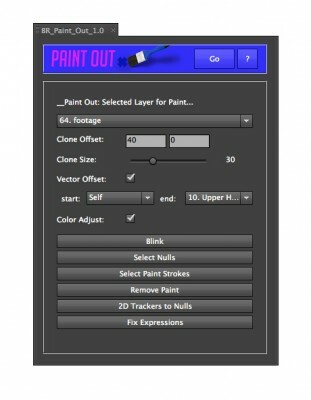 Paint Out uses tracked nulls to manage paint strokes. Tracked nulls can be the nulls created by After Effects' 3D Camera Tracker, the nulls created by importing match-move data or nulls generated by Paint Out itself from 2D trackers. Using these tracked nulls, you can easily create or remove paint strokes in bulk; paint strokes that automatically follow the position of the null. Paint Out's vector feature allows you to define an object's rotation, and rotates the clone accordingly. In other words: Paint Out deals easily with with rotating objects. 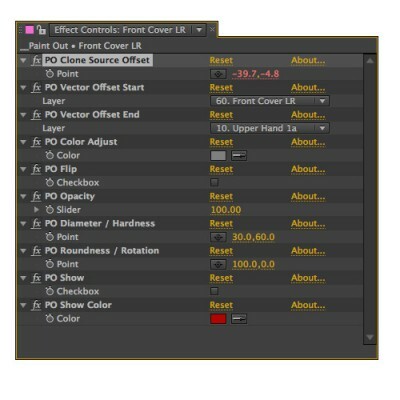 Using the Paint Out controls created on each null, you can tweak the clone stroke's color, size, softness and roundness, you can visualize it with a colored spot, or you can turn it on and off using the null layer's in and out. Give it a try... it really does take the pain out of painting! Adds markers, splits a layer or adds a new text layer with incrementing numbers based on audio intensity.